Time flies, right? Well, that is until you are purposely avoiding something for any period of time. For the past two weeks, I avoided all beverages aside from water in support of the mission of ActiveWater. Now, I will say I cheated. I did not drink all of my water straight from the tap. While I was at work, water was available from a Gordon cooler and I thought, ‘Wouldn’t someone with access to water choose that which is cleanest? I think they would.’ Don’t judge me. I also had water that had limes that had already been cut in it. I actually sat and debated for a second, but one of the women at the church told me that she only did that because the water was so bad there. Again, it was available and “cleaner” so I decided to take her up on it. The past two weeks proved how much I appreciate coffee. It wasn’t so much that I neeeed it to survive, but that I like it. It’s part of my routine and honestly, one of my sources of comfort. When my Uncle Harry passed, i wanted to get a cup of joe so badly but I saw my friend Scott (another challenge participant) mention hot water as an alternative and I tried that. Surprisingly, I really liked it and it fit the bill for the time being. I also found several opportunities to talk about what I was doing. Most people responded that they could never finish such a challenge, but it really wasn’t that hard and I also realized that yes, we are truly spoiled rotten; just like Ricky Schroder. The good news is the only drinks I had to avoid were coffee and coconut water as I quit soda at the end of 2012 and I haven’t been drinking milk. The bad is that I found my coffee intake is pretty substantial. Remember how I mentioned part of my routine? In some ways I am very much a creature of habit. Anyway, I kept track and you’ll find below my completed tally sheet. 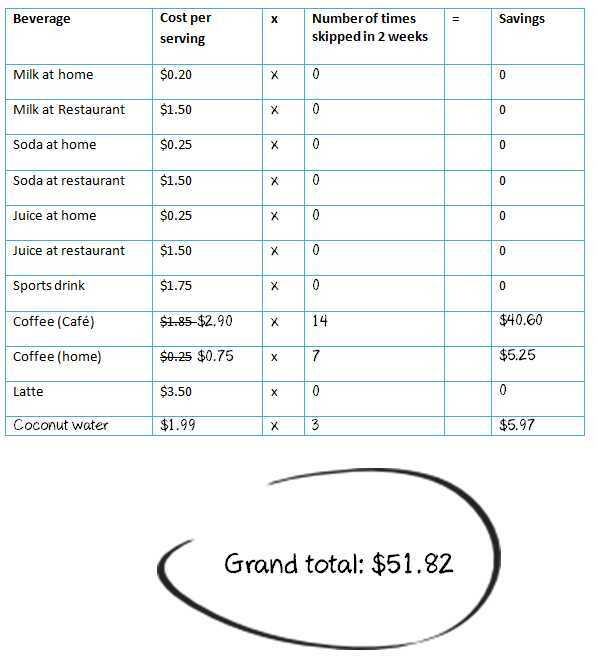 I crossed out the coffee costs as mine doesn’t run that low (oops). I also added my coconut water to round out my list. I’m embarrassed that I typically spend that much on coffee. That’s ridiculous. But, I’m happy that for the past two weeks that savings I racked up will go to a cause I can truly rally around. I also want to call out my friend, Scott Swope, who introduced me to the idea of the challenge and for all of those that supported me throughout. To my friends at Water Street, I missed you and I was so very happy to see you this morning. And to ActiveWater, thank you for the work you do to provide such a basic necessity to those who would never think to take it for granted.